Open daily 24 hours to aircraft traffic. Administration office hours 7 a.m.-6 p.m. Monday-Thursday. 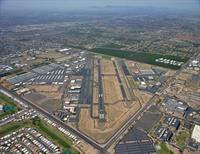 Falcon Field Airport is a municipal general aviation airport that is owned and operated by the City of Mesa, Arizona. Located in northeast Mesa with convenient access to the Loop 202 Red Mountain Freeway, Falcon Field is minutes from hotels & luxury resorts, spring training baseball, entertainment, shopping, Arizona State University, and other metro area cities. The airport is home to more than 700 based aircraft. Two active runways of 5,800 and 3,100 feet accommodate a wide variety of fixed-wing aircraft and helicopters. On-airport businesses offer aviation services - fueling, maintenance and repairs, inspections, avionics, aircraft painting and aircraft interiors - to support aircraft operations, manufacturing, or research & development activities. Aircraft charters, recreational, sight-seeing and photography flights, and flight training are offered by multiple on-airport businesses. On-airport parcels with runway/taxiway access are available for immediate development. A variety of unique hangar facilities are available to fit business needs. The surrounding 7,000-acre business district also offers a range of affordable options. Available properties can accommodate the smallest start-up to an industry leader requiring thousands of square feet. Six industrial parks are located throughout the district, creating an ideal environment for small to large manufacturing and commercial enterprises. Convenient to 3 major freeways: Loop 202 Red Mountain Freeway, 101 Freeway, and Highway 60 Superstition Freeway. From the Loop 202, use Greenfield Exit 20, Higley Exit 21, or McKellips Exit 12.